British director James Marsh has been heralded for his documentary work, with 2008 Academy Award winning 'Man On Wire' and last year's critically acclaimed 'Project Nim'. Now he returns to feature territory with 'Shadow Dancer', a spy drama based on the tension in early 90s Northern Ireland, which never quite delivers what it threatens. The film opens in the 1970s as personal tragedy hits the McVeigh family in Northern Ireland. Twenty years later, Collette McVeigh (Andrea Riseborough) is involved in an aborted IRA bomb attempt in London and is caught by MI5. Threatened with prison but offered a way out, she turns informant to protect her child. But with suspicions mounting back home, Collette becomes the person most in need of protection. 'Shadow Dancer' began as a novel, written by ITN political correspondent Tom Bradby, who was on hand to pen the subsequent screenplay. Bradby wisely eschews political ideologies in his film adaptation, instead centering the drama around the McVeigh family and the difficult relationship between informant and handler (Clive Owen). 'Tinker Tailor Soldier Spy' underplayed one of its greatest reveals and James Marsh elects to do the same in 'Shadow Dancer', to the detriment of the film's dramatic build-up. Bradby's screenplay. One area in which Bradby and Marsh excel however is the film's shocking resolution, an ending that will remain long in the memory. 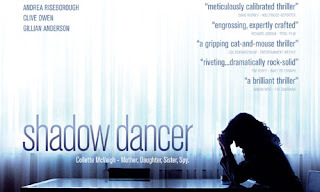 'Shadow Dancer' is a slow-burner that only truly sets alight in its final scene. Its legacy however may prove more fruitful - building on the likes of 'Never Let Me Go', 'Made In Dagenham', and 'W.E.' to propel Andrea Riseborough into much deserved higher profile roles. 'Shadow Dancer' is out in UK cinemas today, through Paramount Pictures.